Li, Z., Liu, Q., Chen, J., and Fu, Y. (2019). "Enhancement of colloidal particle and lignin removal from pre-hydrolysis liquor by pectinase pre-treatment – Study on model substances," BioRes. 14(1), 409-420. Removal of colloidal particle and lignin from pre-hydrolysis liquor (PHL) is important for the subsequent processing and utilization of the saccharides in the PHL. Cationic polymers treatment is a common method for the purpose, and pectinase pre-treatment of PHL can improve the efficiency of the treatment with cationic polymers. To investigate the mechanism of pectinase pre-treatment for improvement of the cationic polymer efficiency, polygalacturonic acid (PGA) was added in the colloidal lignin and dissolved lignin model substances systems, respectively, and the effects of polygalacturonic acid (PGA) and its pectinase pre-treatment on the removal of colloidal and dissolved lignin in the following cationic polymer treatment process were studied. The results showed that the presence of PGA caused the increase of negative charge density of the colloidal lignin and dissolved lignin systems, which lowered the efficiency of the cationic polymers and negatively affected the removal of both the colloidal lignin and the dissolved lignin. After pectinase treatment, the PGA present in the colloidal and dissolved lignin system was degraded and the negative effects on the cationic polymers were eliminated, and the efficiency of the cationic polymers was improved. Compared to the colloidal lignin and dissolved lignin systems with PGA, less cationic polymers were needed for the same systems with pectinase treatment to obtain the similar lignin removal level. In the kraft-based dissolving pulp production process, pre-hydrolysis, which is also called autohydrolysis and hydrothermal treatment, is used to remove the hemicelluloses prior to pulping. Hemicelluloses can be used to produce platform chemicals, biomaterials, and biofuels (Sedlmeyer 2011; Deutschmann and Dekker 2012; Goswami et al. 2015). The extraction of hemicelluloses by pre-hydrolysis prior to pulping is one of the most effective processes for woody biomass biorefinery (Garrote et al. 1999; Mao et al. 2008). In addition to the hemicelluloses, the pre-hydrolysis liquor (PHL) contains the carbohydrate degradation products, lignin, and lignin-derived phenolic compounds, in colloidal form or dissolved in the PHL (Yasarla and Ramarao 2012). The separation and purification of the hemicellulose saccharides in the PHL is necessary for their high value-added utilization. For example, when the hemicellulose saccharides in the PHL are used for biofuel production, the compounds in the PHLs such as acetic acid, furfural, 5-hydroxy methyl furfural, and small molecule phenolics are the inhibitors of the enzyme treatment and the fermentation process that follows (Palmqvist and Hahnhägerdal 2000; Oliva et al. 2006). Membrane filtration is an alternative for removal of those small molecule organics such as acetic acid and furfural from the PHL and hemicelluloses saccharide enrichment (Oliva et al. 2006). However, the colloid particles and the high molecular weight lignin tend to foul the ﬁltration membranes, which lowers the lifetime of the membranes and hurts the separation efficiency (Koivula et al. 2013). It is essential to remove the lignin in the PHL for the utilization of the hemicellulose saccharides in the PHL. The lignin removal and separation from the PHL can be achieved by treatment with acid (Fatehi et al. 2016), activated carbon (Ahsan et al. 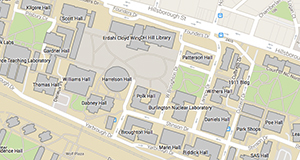 2014), lime (Shen et al. 2012; Shi et al. 2012), ion exchange resin (Liu et al. 2014; Chen et al. 2016), cationic or nonionic polymers (Duarte et al. 2010; Yasarla and Ramarao 2012; Yasarla and Ramarao 2013), enzymes (Wang et al. 2014; Jiang et al. 2018), and by a combination of some of the methods (Shi et al. 2011; Shen et al. 2013). Some hemicellulose saccharides also are lost with the removal of the lignin during the treatment of the PHL (Fatehi et al. 2013; Koivula et al. 2013). The PHL is negatively charged mainly due to the negatively charged lignin and the uronic acids released during the pre-hydrolysis; therefore, the cationic polymers can be used to remove the lignin by flocculation through a charge neutralization or bridging mechanism. Cationic polymers such as inorganic polymer polyaluminum (PAC), natural polymer chitosan, and synthetic polymers including cationic poly acrylamide (CPAM), poly diallyl dimethyl ammonium chloride (PDADMAC), and poly ethylene imine (PEI) have been used for the removal of the particulates and the lignin from wood PHL. For example, Rakesh Yasarla and Ramarao (2012) reported that almost all the colloidal particles and part of the dissolved lignin were removed when the hydrolysates of sugar maple were treated with alum, PEI, PDADMAC, and CPAM, respectively, accompanied by a loss of some sugars. Saeed et al. (2012) found that 30 or 35% of lignin was removed by adding 1.2 or 1.4 mg of g-1 PDADMAC or chitosan to the pretreated PHL with acid and lime, respectively, with a significant loss of sugars (Saeed et al. 2012). Enzyme also was used to treat the PHL to improve the lignin removal. Wang et al. (2014) reported that approximately 46 to 61% of the lignin in the PHL was removed with the laccase treatment due to the polymerization of the lignin in the PHL induced by laccase, and the subsequent flocculation using cationic polymers could further remove 10 to 15% of the lignin, accompanied by a 12 to 15% loss of the total sugar. The PEI and PDADMAC, with low molecular weight and high charge density, cause the colloid destabilization through a charge patching (charge neutralization) mechanism, and CPAM, with high molecular weight and low charge density, causes the colloid destabilization through a bridging mechanism (Nurmi et al. 2004; Yu et al. 2006; Yasarla and Ramarao 2012). The negative charge in the PHL will negatively affect the efficiency of the colloidal particle and lignin removal when the cationic polymers are used to treat the wood PHL. The main component of the colloidal particles in the PHL is lignin (Wang et al. 2015). Previous results from the authors showed that the polygalacturonic acid was an important source of the polyanion of the PHL, and it contributed to about 50% of the polyanion of the PHL obtained from the pre-hydrolysis of aspen at 170oC for 60 min (Jiang et al. 2018). It has been found that the polygalacturonic acid negatively affects the efficiency of cationic polymers in papermaking, and pectinase treatment that caused the degradation of the polygalacturonic acid can inhibit the problems induced by the anionic trash and improve the efficiency of the cationic polymers (Thornton 1994; Sundberg et al. 1998; Ricard and Reid 2004; Pruszynski et al. 2011). Previous work also showed that the degradation of polygalacturonic acid by pectinase pre-treatment caused the improvement of the efficiency of the cationic polymer for the colloidal particle and lignin removal from PHL (Jiang et al. 2018). To investigate the mechanism of pectinase treatment for the improvement of colloidal particle and lignin removal, in the present work, the colloidal lignin and dissolved lignin solutions were prepared, and they were used as the model substances of colloidal particles and dissolved lignin, respectively. Polygalacturonic acid was added into the colloidal lignin and dissolved lignin solutions, respectively, and the effects of the pectinase treatment on the cationic polymer efficiency of colloidal lignin and dissolved lignin removal was investigated. Kraft lignin 1 and lignin 2 were purchased from Sigma-Aldrich (St. Louis, MO, USA). Lignin 1 was water insoluble, and lignin 2 was water soluble with an average molecular weight (Mw) of 10000 g mol-1 (data provide by Sigma-Aldrich). The Pectinase P2611 (from Aspergillus aculeatus) and pectin were purchased from Sigma-Aldrich. The pectinase activity was determined at pH 4.8 and 50 °C with 10 g/L of pectin solution. One activity unit was defined as the amount of pectinase producing 1 mg galacturonic acid per h by decomposing pectin at the measured conditions, and the measured pectinase activity was 1300 U/mL. The polygalacturonic acid sodium (PGA) was purchased from Sigma-Aldrich; the negative charge density was 1.80 mmol g-1 at pH 4.0. The PDADMAC was provided by Jiangsu Feymer Technology Co., Ltd, (Zhangjiagang, China). Its average molecular weight and cationic charge density at pH 4.0 was 150000 g mol-1 and 6.15 mmol g-1(based on 100% purity and total dryness). The colloidal lignin was prepared according to the method reported by Lievonen et al. (2016), with some modifications. In brief, lignin was dissolved in tetrahydrofuran (THF, analytical grade) at 2.0 g L-1, and the solution stood for 8 h to precipitate the insoluble substance. Subsequently, the supernatant was introduced into a dialysis bag (Spectra/Pro® 6 standard RC dialysis tubing, 8 kDa, Spectrum Labs, Rancho Dominguez, CA, USA), which was immersed in an excess of deionized water with stirring in a 10 L bucket. The deionized water was replaced periodically, and the dialysis took place for at least 24 h. The colloidal lignin particle suspension was formed and the THF was removed during the dialysis. The colloidal concentration obtained was 1.13 g L-1, measured by the weight method. The surface charge or charge density of the colloidal lignin samples, dissolved lignin sample, PGA, cationic polymers, and other samples were measured by titrating with standard solutions of PVSK or PDADMAC (0.001 mmol L-1) using a Mütek Particle Charge Detector PCD-03 (Herrsching, Germany). A total of 300 mL of colloidal was added into a 250 mL Erlenmeyer flask, and the desired amount of PGA was added. Then 2 mL of the pectinase solution was added to the flask. The treatment was carried out in a shaker in a water bath at 40 °C and with a pH of 4.5 for 6 h to ensure the complete degradation of the PGA and that no more galacturonic acid formation was detected at the prolonged treatment time. At the end of the treatment, the reaction was inactivated at 100 °C for 5 min. For the CL + PGA or DL + PGA samples, a deactivated enzyme (heated at 100 °C for 5 min) was used to treat the samples, and all other conditions were the same as those of the pectinase treatment. A total of 2 mL of the PDADMAC solution with the desired concentration was added into 40 mL of the colloidal or dissolved lignin samples in an Erlenmeyer flask at room temperature and pH 4.0, and then the Erlenmeyer flask was stirred for 10 min at 120 rpm. After standing for 24 h to remove the flocs, the supernatant was used for analysis. The dissolved lignin concentration was measured based on the UV/Vis spectrometric method at a wavelength of 280 nm based on Lambert-Beer law. It is well known that lignin has a maximum characteristic absorption peak at 280 nm. The standard line was obtained by measuring the UV absorbance of a series lignin solution with different concentration at 280 nm, and the following formula was used for calculation of the lignin concentration: L = 0.0687 AD. Here L is the lignin concentration (g L-1), A is the Absorbance, and D is the Dilution Multiple. The dissolved lignin concentration was analyzed in duplicate. The zeta potential and particle size of the samples were determined using a Zetasizer NanoZS90 (Malvern Instrument, Malvern, UK) at 25 °C. Turbidity of the samples was determined with a WGZ-800 turbidimeter (Shanghai Xinrui Instruments & meters Co. Ltd, Shanghai, China). The zeta potential and turbidity of the samples’ measurements were all done in duplicate. As shown in Table 1, with the increase of pH, the surface charge of the colloidal lignin increased, which was due to the increase of the ionized carboxyl at a higher pH. The zeta potential and averaged particle size of the colloidal lignin were little affected by pH. Negatively charged PGA was added in the colloidal lignin, and the negative charge of the colloidal lignin + the PGA system with and without pectinase treatment was measured. The theoretical charge neutralization point for the PDADMAC was calculated, and the results are shown in Table 2. With the addition of the PGA, the negative charge of the colloidal systems increased obviously, and the values were much higher than the single colloidal lignin system. After the pectinase treatment, the negative charge of the colloidal systems with PGA decreased sharply and were similar to the negative charge level of the colloidal lignin system without PGA, which was due to degradation of PGA by pectinase. PDADMAC is a common cationic polymer used for colloidal and dissolved lignin removal from PHL by flocculation. 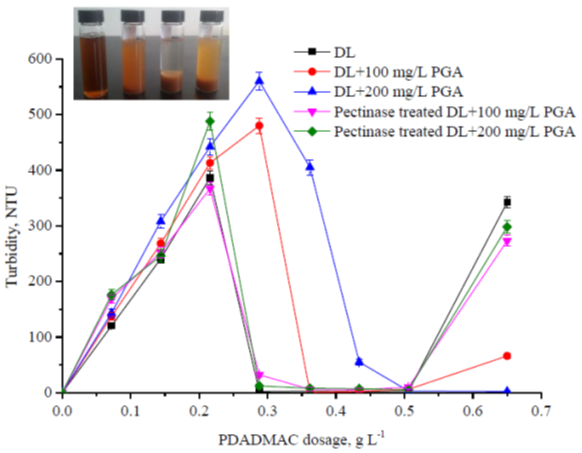 The effects of PDADMAC on the stability of the colloidal lignin system were studied, and the results are shown in Figs. 1 and 2. The turbidity of the colloidal system is related to the concentration of the colloidal matter (Bobacka and Eklund 1999; Huo et al. 2001), so the residual turbidity of the colloidal system after cationic polymer treatment and flocs removal can be used to represent the stability and the residual colloid concentration of the colloidal system. As shown in Figs. 1 and 2, for colloidal lignin (CL), with the addition of PDADMAC both the residual turbidity and the absolute value of the zeta potential of the colloidal lignin decreased sharply. At about the theoretical charge neutralization point (5.5 mg PDADMAC/L), its residual turbidity decreased to below 20 NTU and the zeta potential approached zero, which indicated that the colloidal lignin was nearly destabilized and removed completely. 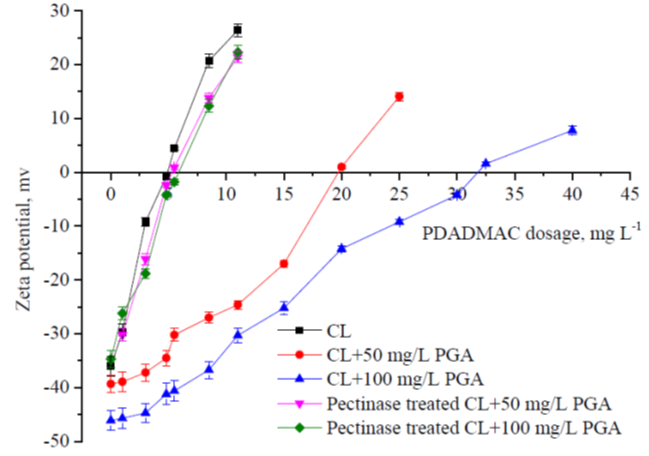 When the PGA was added in the CL system, the stability of the CL was improved obviously, and much more PDADMAC was needed for total colloid destabilization and lignin removal, which depended on the PGA added. PGA acted as a stabilizer for colloidal lignin, which is similar to the effects of PGA on colloidal substances in papermaking (Li et al. 2013). 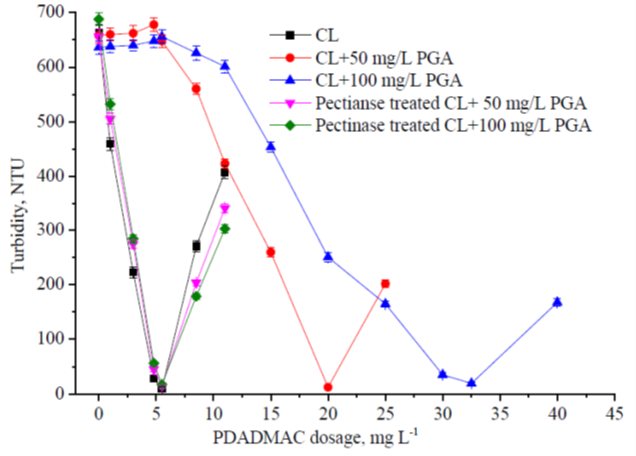 Compared to the CL+ PGA system, the stability of the pectinase treated CL+ PGA system decreased sharply, and much less PDADMAC was needed for the complete destabilization of the colloidal system, which was similar to the CL system without PGA addition. For these colloidal systems, their complete destabilization all took place at about the theoretical charge neutralization point for PDADMAC, which indicated that the charge repulsion among the surface negatively charged lignin particles dominated the stability of the colloidal lignin system, and PDADMAC caused the colloid destabilization through a charge patching (charge neutralization) mechanism (Yasarla and Ramarao 2012). The negatively charged PGA consumed the cationic polymer and improved the stability of the colloidal lignin, which negatively affected the colloidal lignin removal. When the PGA was treated with pectinase, it was depolymerized to the monomers or oligomers with low degree of polymerization that did not contribute to the stability of the colloidal lignin against the cationic polymers (Ricard and Reid 2004), so the efficiency of the cationic polymers was improved after pectinase treatment. For all the colloidal systems, when PDADMAC addition exceeded the theoretical charge neutralization point, the turbidity of the colloidal systems increased, which indicated that the colloidal systems had become re-stabilized. This was because a large amount of cationic polymer was absorbed on the surface of the colloidal lignin particles and caused their surface charge to be converted to a net cationic charge, which re-stabilized the colloidal system by electrostatic repulsion. The zeta potential became positive, as excess cationic polymers were added, which brought about the cationization of the colloidal systems. The results were consistent with the previous report about the treatment of PHL with cationic polymer (Jiang et al. 2018). In addition to the colloidal lignin, there were large amounts of lignin or lignin-like substances dissolved in the PHL. The PGA was added into the model dissolved lignin (DL) solution, and the effects of the PGA and pectinase treatment on the dissolved lignin removal during cationic polymer flocculation were studied. The results are shown in Figs. 3 through 5. The negative charge density of the dissolved lignin (DL), DL + 100 mg/L PGA, DL + 200 mg/L PGA, pectinase treated DL + 100 mg/L PGA and pectinase treated DL + 200 mg/L PGA were 2.23 mmol/L, 2.40 mmol/L, 2.55mmol/L, 2.27 mmol/L, and 2.27 mmol/L, respectively. With the addition of the PDADMAC, part of the negatively charged lignin would be flocculated and removed. As shown in Fig. 3, with the increase of the PDADMAC dosage, the DL removal increased. For DL, when the PDADMAC dosage was 0.288 mg/L, 92.5% of the dissolved lignin was removed, but for DL + 100 mg/L PGA and DL + 200 mg/L PGA systems, only 36.5% and 34% of the dissolved lignin was removed at the same PDADMAC dosage, respectively, and if the similar dissolved lignin removal to the DL system was obtained, the PDADMAC additions for them were 0.362 g/L and 0.434 g/L, respectively. It could be concluded that the negatively charged PGA affected the efficiency of the cationic polymer for flocculation and removal of the dissolved lignin. 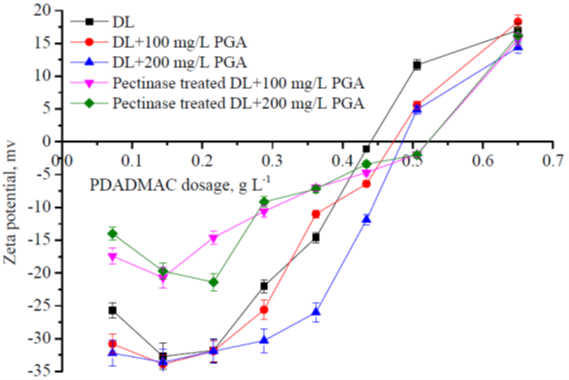 After the pectinase treatment, the negative effects of the PGA on the efficiency of PDADMAC were eliminated, and at the same PDADMAC dosage, the lignin removal from the pectinase treated samples was similar to that from the DL samples without the PGA addition. For example, when the PDADMAC dosage was 0.288 mg/L, 88.5% and 89% of lignin removal was obtained for the pectinase treated DL + 100 mg/L PGA and DL + 200 mg/L PGA systems, which approached the lignin removal level for DL system. The picture of the samples in Fig. 3 distinctly shows the different lignin removal with PDADMAC flocculation. From left to right, the samples were: origin sample (untreated), DL, DL + 100 mg/L PGA, DL + 200 mg/L PGA, pectinase treated DL + 100 mg/L PGA, and pectinase treated DL + 200 mg/L PGA, all the last five samples were treated with 0.288 mg PDADMAC/L samples. With the addition of PDADMAC, in addition to the formation of the big size flocs that could be removed by precipitation, colloidal polyelectrolyte complexes of the dissolved lignin and PDADMAC were also formed. As shown in Fig. 4, the turbidity of the samples increased when the PDADMAC dosage increased after precipitation, and the averaged particle size (280 to 620 nm, detailed results were not shown) indicated the formation of colloidal particles. The formation of the colloidal polyelectrolyte complexes between cationic polymers and negatively charged xylan in papermaking (Ström et al. 1985). 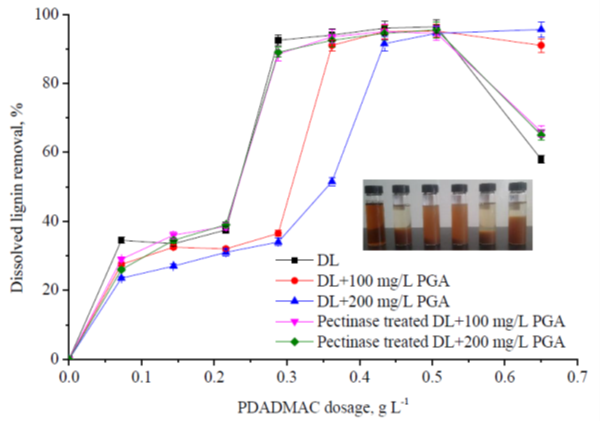 With further increasing PDADMAC dosage, the formed colloidal particles were destabilized and removed, and the lignin removal reached a high level. When the excess PDADMAC was added, the colloidal particles tended to be re-stabilized due to electrostatic repulsion of the surface charge which converted to a net cationic charge. Consequently, the turbidity of the system increased as the excess PDADMAC was added and the removal of the lignin decreased (as shown in Fig. 3). The change of the dissolved lignin system with the PDADMAC addition was distinctly shown in Fig. 4. From left to right, the PDADMAC dosage was 0 mg/L, 0.144 mg/L, 0.288 mg/L, and 0.65 mg/L, respectively. As shown in Fig. 5, with the small amount of PDADMAC addition, the absolute value of the zeta potential of all systems increased, which was because that the first small amount of PDADMAC caused highly negatively charged polymers to precipitate out of the solution and become absorbed on the surfaces of the particles. With the further increase of the PDADMAC dosage, the absolute value of the zeta potential decreased, and the zeta potential of the systems converted to positive charges with the excess PDADMAC addition. This was similar to the results of adding PDADMAC to colloidal lignin. It can be concluded that the excess addition of cationic polymers was disadvantageous for both the colloidal lignin and the dissolved lignin removal from the PHL. From the above results of the colloidal and dissolved lignin removal by the PDADMAC treatment, it can be concluded that in order to obtain high colloidal and dissolved lignin removal from the PHL, the zeta potential of the PHL should be monitored. The highest colloidal and dissolved lignin removal was obtained as the zeta potential approached zero, and it should not convert to a positive charge during treatment. The previous results about the colloidal particles and lignin removal from PHL also proved this (Jiang et al. 2018). During the flocculation of the dissolved and colloidal lignin, the presence of the negatively charged polygalacturonic acid negatively affected the efficiency of the cationic polymers. Compared to the colloidal or dissolved lignin system without polygalacturonic acid, to reach the similar lignin removal more cationic polymer was needed in the presence of polygalacuroinc acid. The degradation of polygalacturonic acid by pectinase lowered the negative charge density of the systems, which eliminated its negative effects on the efficiency of the cationic polymers and improved the removal of the colloidal and dissolved lignin. The authors would like to acknowledge the financial support of the National Natural Science Foundation of China (Grant No. 31470601 and 31870563). Huo, X., Venditti, R. A., and Chang, H. (2001). “Effect of cationic polymers, salts and fibres on the stability of model micro-stickies,” J. Pulp. Pap. Sci. 27(6), 207-212. Mao, H., Genco, J. M., van Heiningen, A., and Pendse, H. (2008). “Near-neutral pre-extraction before hardwood kraft pulping; A biorefinery producing pulp, ethanol and acetic acid,” in: Proceedings of International Conference on Pulping, Papermaking and Biotechnology, Nanjing, China, pp. 145-156. Nurmi, M., Byskata J., and Eklund D. (2004). “On the interaction between cationic polyacrylamide and dissolved and colloidal substances in thermomechanical pulp,” Paperi Ja Puu [Paper and Wood] 86(2), 109-112. Article submitted: August 1, 2018; Peer review completed: November 8, 2018; Revised version received: November 14, 2018; Accepted: November 17, 2018; Published: November 26, 2018.